← Review: Salman gets it right in Bajrangi Bhaijaan! Jab Pyar Kisise Hota Hai: When Dev-Asha made the audience go Uff Yumma! Speckled in song, dance and romance, Nasir Hussain’s feel-good, frothy creations are a breeze to sit through. It’s a formula the filmmaker never strayed from and which soon became his identity. Perhaps his scripts, vigorously recycled over a number of films and decades, appear worn-out in context of today’s content-driven cinema. Still there’s no faulting his craft as far as showmanship goes. Revisiting Dev Anand and Asha Parekh’s cheerful courtship in the 1961 black and white super-hit, Jab Pyar Kisise Hota Haionly affirms my view. Mistaken identity is one of Hussain’s recurring plot devices and this one too works around the same ruse. Either A is pretending to be B or B is masquerading as A and A has to prove he’s the real A or something reliably along those lines. In Jab Pyar Kisise Hota Hai, Dev Anand plays Sunder aka Monto impersonating a certain Mr Popatlal (Rajendra Nath in a frilly dress and hat) to get close to Nisha (Parekh). Apparently, the two were promised to each other as babies by their respective BFF mommies. But after Nisha’s mom dies, her wealthy father (Mubarak) goes back on his word and plans to marry her off to his trusted employee (Pran, who else?) instead. Standard 1960s issues –heroine’s marriage, hero’s money (or lack of it). What’s unintentionally comic is Monto’s mother’s (Sulochana Latkar) doggedness over the matter. At one point, she tells Monto how her deceased pal came to see her in a dream recently and implored her to make the wedding happen. 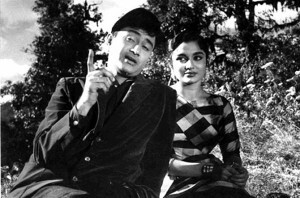 Even funnier is Dev Anand’s mildly concealed incredulity while he humours her. 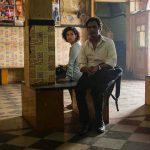 Meanwhile, he bumps into Nisha in Darjeeling — back when all the world’s “zaroori kaam” would conveniently lead the hero and heroine to scenic hill stations. He flirts and fawns. She burbles and blushes. Dance-offs, bhang ke ladoos, pie-fights, train-themed serenades ensue, bond, bicker or banter — these two don’t waste any time falling in love. Songs take precedence over the story till about half way into Jab Pyar Kisi Se Hota Hai. Yet Dev Saab’s stylish overtures, his teenage ladylove’s adorable adas and chic quotient set to Shankar-Jaikishan’s lilting melodies, dipped in Hasrat Jaipuri and Shaildenra’s affectionate lyricism, like Uff Yumma (Mohammad Rafi in complete element), Jeeya Ho Kuch Bol Do, Sau Saal Pehle and Teri Zulfon Se Judaai keep us glued. As do Rajendra Nath’s silly antics (such droll Hamam soap jingle hilarity) as Mr Popatlal. It provided a much-needed career breakthrough for the comedian and cemented his image as big screen’s go-to bungling buffoon. That handsome, command-parroting lackey by his side, in case you didn’t recognise, is none other Hussain’s younger brother and Aamir Khan’s father, Tahir. Back in the rom-com, a smoothly smug Pran catches up with the lovey-dovey couple and does his customary bit as spoilsport. Nisha’s murdered friend works as catalyst of this easily foreseeable complication. As if the rich-poor dispute wasn’t nagging this on and off pair long enough, there’s Montu making a big fuss over Nisha’s reluctance to walk out on her guilt-tripping daddy. 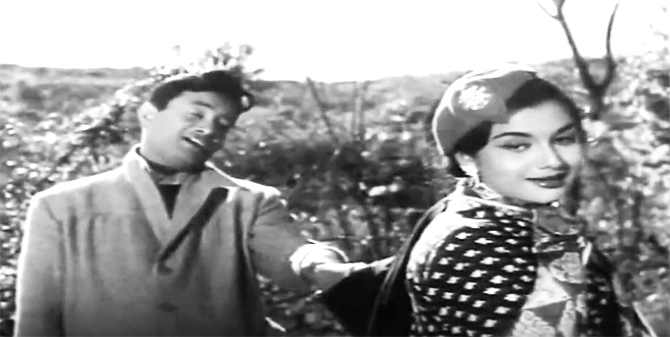 He even shunts her rudely during Lata Mangeshkar’s rendition of its ardent title song. Not nice considering he’s duped her under a false identity and concealing the truth of his involvement in her friend’s past. Despite the constant influx of hollow misunderstandings and uneven twists, Jab Pyar Kisise Hota Hai’s crisp momentum and winsome cast does its best to retain our interest if not enthusiasm. Parekh, who made her debut as leading lady in Hussain’s 1959 confection Dil Deke Dekho, was an instant pick for the first film under his own banner, a collaboration that hit many a jackpots like Phir Wohi Dil Laya Hoon, Pyar Ka Mausam, Teesri Manzil and Caravan. Kathak master Gopi Krishna’s energetic classical moves play on the dancing star’s strengths while Hussain focuses on her ebullience. In his autobiography, Romancing With Life, Dev Anand writes how meeting the legendary mountaineer Tenzing Norgay in Darjeeling during its filming instilled a deep love for the mountains and prompted him to set his 1974 film, Ishq Ishq Ishq in the hilly regions of Nepal. 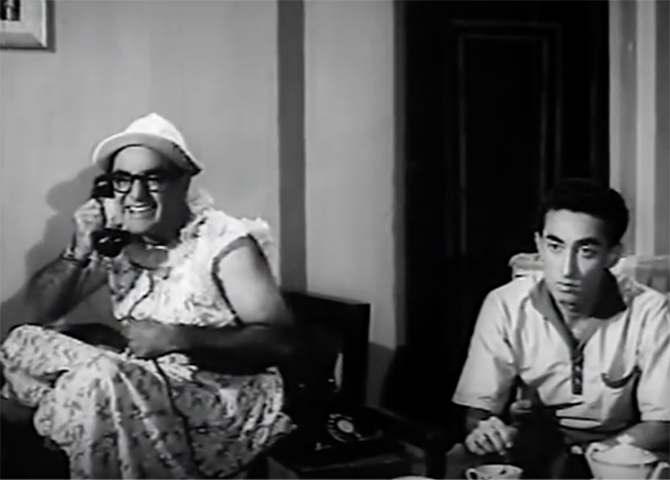 Interestingly, Shammi Kapoor, who seems a natural fit for such lover boy parts and had worked on Nasir Hussain’s previous hits Dil Deke Dekho and Tumsa Nahi Dekha, was approached to play Montu after the filmmaker had settled on Parekh and the composer duo Shankar Jaikishan. This pinched Kapoor’s ego, he felt slighted and declined the role. 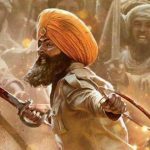 Although he suspected Hussain already had “Dev” in mind for the part. 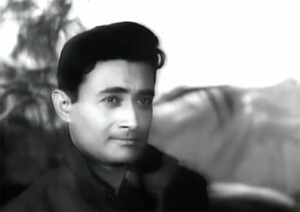 In one of his anecdote- rich YouTube interviews, he shares how “Dev Anand was Subodh Mukerji’s hero (Paying Guest, Munimji).” Seeing Dev was teaming up with Nasir Hussain, Mukerji reacted by offering him a project titled Mr Hitler, which went on to become Junglee and one of the biggest hits of the same year. 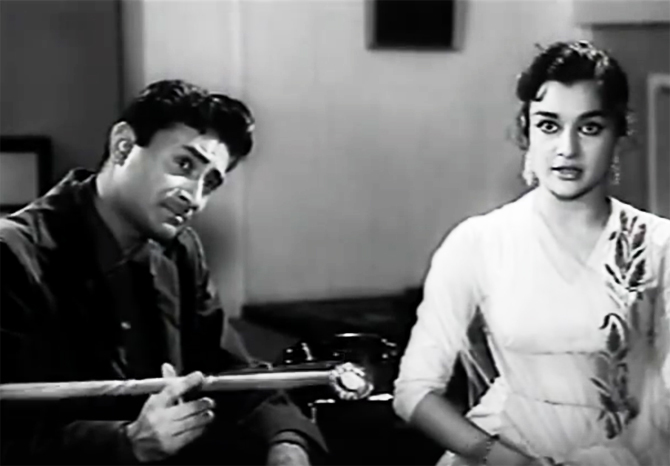 While it sure gave the hot stepper a lot to ‘Yahoo’ about, Dev Anand and Asha Parekh’s Uff Yumma chemistry infused in Nasir Hussain’s signature shimmer and shine has its own charm. This entry was posted in Classics, Columns & Reviews and tagged 1961, asha parekh, dev anand, jab pyar kisise hota hai, mr popatlal, nasir hussain, pran, rajendra nath, romance, Shankar Jaikishen. Bookmark the permalink.